Throw your cares to the wind, and follow your Hopes and Dreams with a stay at this sunny Corolla home that has all the amenities that vacationers require to relax and soak up the beach life. 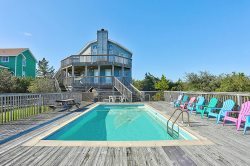 Located in Ocean Sands, and found an 8-minute walk away from the beach access, this breezy 5 bedroom, 3 bath home offers miles of fun on-site to ensure that a dreamy OBX vacation is within reach. Take a twilight stroll to the lake or the beach, or enjoy your own watery fun in your spacious private pool that’s nicely protected by a privacy fence and a generous helping of native landscaping. Step inside, and let the fun and games continue in the ground level game room which features a pool table and ample room to relax. A new queen sleeper sofa has been added for extra sleeping space. There’s also a kid-friendly bedroom on this level with pyramid bunk and trundle, and additional outdoor amenities include a basketball and an enclosed outdoor shower. Drift off to sleep in the second level, where three tastefully appointed bedrooms ensure plenty of sweet dreams. There’s a master suite with a queen bed, a bedroom with queen bed and adjoining bath, and a bedroom with two sets of bunk beds. A laundry closet with washer and dryer is found nearby, and guests will be just steps away from the covered second level porch, which is home to the therapeutic hot tub. Reconnect after a full day of exploring the Corolla community in the top level great room, which features ample space to stretch out, as well as a full array of modern amenities, The living area features a fireplace, a 55” inch Sharp HGTVD, and a NEW Wireless and Bluetooth Sound Bar, while the outside sun deck and screened porch allow guests to enjoy those natural sea breezes and ocean views. A Master Suite with king bed is also located on this level, which features a master bath with whirlpool tub and shower. With lots of decadent ways to enjoy the scene, this level is the destination for fun gatherings and miles of community views. From a suite of modern accouterments to a coveted location in the heart of Corolla, there’s a lot of joy to discover when you heed the call of your Hopes and Dreams. Grab the family, and start planning your escape to this pristine paradise in the breathtaking Northern Outer Banks. Section I Ocean Sands. Milepost CC 7.